It&apos;s a bit scary when Halloween falls on a week night, for teachers, anyway. Ha! But in all honesty, there are some great advantages to a school night holiday. It often means that the weekend prior will be packed with opportunities to stretch out the fun and get more use out of those costumes.This weekend, in Hendricks County, you&apos;ll find Halloween fun for the whole family, as well as some awesome opportunities to enjoy the best of the season&apos;s colors, weather and that gorgeous sky. Start the weekend off with a true par-tay. 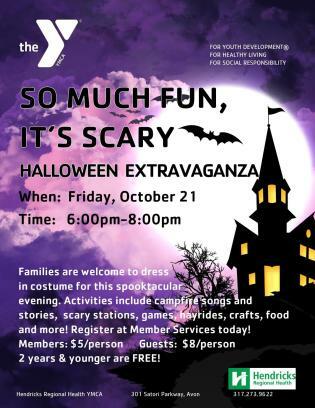 The YMCA in Avon will put their spacious grounds to good use for this spooktacular event. Roast marshmallows around the campfire, take a haunted hayride and enjoy the many games and crafts. This is sure to be a hit - for all ages. When: Friday, October 27th from 6-8 p.m.
Where: Hendricks Regional Health YMCA - 301 Satori Parkway, Avon. Cost: Guests 2 years and younger are free. Members - $5 per person. Non-members - $8 per person. Halloween fun is great and all, but it can be a bit stressful. Luckily, the perfect opportunity to relax, while taking in the beauty of the season, is being offered with a Yoga in the Park event. This class is suitable for all levels - enthusiasts and amateurs alike. Bring a friend, a mat, a towel, some water and come enjoy this unique opportunity to unwind in nature. We are extremely fortunate, in Hendricks County, to have so many opportunities throughout the year to learn from the Indiana Astronomical Society about astronomy. This weekend provides another such opportunity. The IAS will host an informational session about what makes up the night sky and provide tips for exploring on your own. Afterward, (weather permitting) you&apos;ll have a chance to stargaze, using your own telescope or their powerful telescopes for all guests to share. The fall sky is breathtaking - especially at night. Come explore and enjoy it. When: Saturday, October 28th from 6:30-8:30 p.m.
No tricks here, just an awesome treat for the adults. Come enjoy live music and entertainment, grub on good eats from a variety of food truck vendors and, of course, sample a lot of delicious brew. 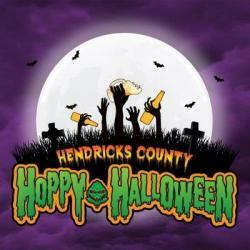 Brew Link Brewing of Plainfield is hosting this Hoppy Halloween event and they&apos;ve invited over 20 Indiana craft breweries to join in the fun. Come enjoy unlimited samples of over 100 local unique craft beers. That&apos;s right, unlimited. You&apos;ll also enjoy games, raffles and a costume contest. This event is sure to become a Hendricks County tradition. When: Saturday, October 28th from 1-5 p.m.
Hendricks County&apos;s very own haunted house. So great. Our family always enjoys this haunted house. I love that the fine folks of Danville always change it up. This year, they have added a food truck and porta-potties. That&apos;s right, they heard the people and they accommodated. I&apos;ve never thought of the lines as being any longer than those at other haunted houses, but I appreciate the added option of grabbing a bite or beverage while we wait. This haunted house is hosted in the Historic (some might say, creepy) Hargrave gym. Don&apos;t let the small town charm fool you - prepare to be scared. When: Saturday, October 28th from 7-11 p.m. Cost: General Admission $7 per person. Fast Pass $12 per person. Last, but certainly not least, is one of my favorite events of the season - Dog Daze at the Maze. Beasley&apos;s knows how to put on an event, but when they open their gorgeous grounds up to the pups, it doesn&apos;t get any better. After my kids reached a certain age, Dog Daze quickly became our new tradition. 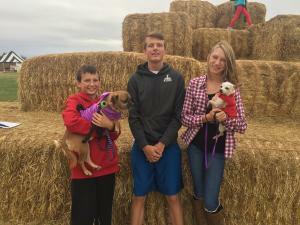 When your "too cool" kids no longer pose willingly for pictures on hay mountain - without being bribed with cider slushies (well played teens, well played) - it&apos;s a good time to embrace doggy costumes and photos of your pups. I have found that said "too cool" kids are often unaware that I&apos;m actually snapping pictures of them when they are holding hilarious, costume adorned, pups. Well played mom, well played. Anyway, there is something extra awesome about enjoying all the fall festivities at Beasley&apos;s with your four-legged friends in tow. I find that folks are pleasantly led by their pups. Dogs stop every five seconds to breath in the fall air, to listen tentatively to every rustling leaf and excitedly explore every corner of the corn maze. It&apos;s a good reminder to slow down and enjoy the little things. During Dog Daze at the Maze, you&apos;ll find all the things you love about Beasley&apos;s and their fantastic events with an additional focus on the furry ones - good food, yummy cider, hayrides, their new apple canons, Barnyard Bonanza family activity area, pet supply vendors and all things fall. This event aims to raise money and awareness for local rescue groups - you can even visit and learn about precious pets that are in need of a home. Come explore the gorgeous grounds at Beasley&apos;s and enjoy one final fall event with your whole family. When: Saturday and Sunday, October 28th-29th from noon-6 p.m. Cost: Donations encouraged. Prices vary by activity.